Capri is located just an hour from Naples by boat. This tiny, rugged island is a must if you’re planning a trip to Southern Italy. Most people visit Capri for a day, but we highly recommend going for an overnight stay. We’ve done the day trip in the past, and it wasn’t nearly as enjoyable as the experience that we had this time. Once the last ferries to the mainland leave, you’ll have the island to yourself. Where to stay in Capri. 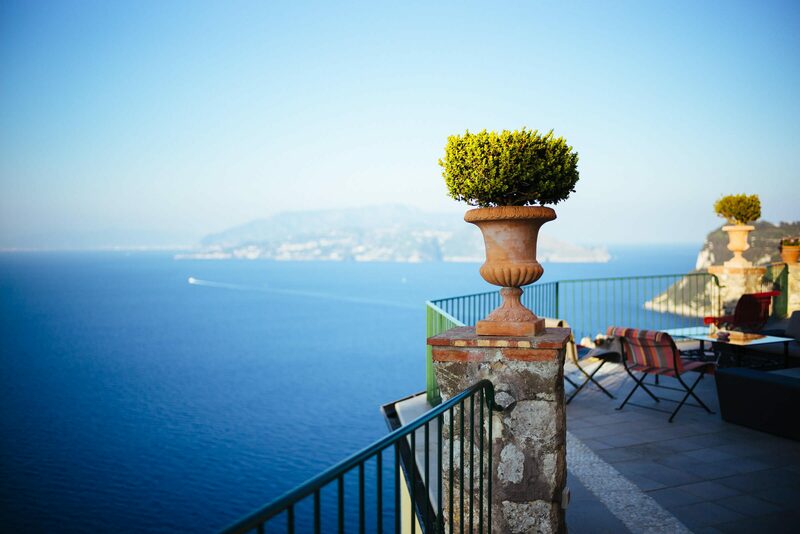 For the most relaxing and luxurious vacation, stay in Anacapri. It takes extra effort to get to, so it’s generally quieter and less crowded. We chose Hotel Caesar Augustus out of all the hotels in Anacapri, mainly for its culinary program, but also for its amazing view. It clings to the cliff high above the Mediterranean Sea and has a beautiful double infinity pool and a huge terraced vegetable garden. Here you can relax and enjoy the view, pool, and cocktails while the day tourists fill the streets, then head out for a late dinner once it quiets down. Where to eat in Capri. Plan to have a leisurely lunch and dinner (allow two hours for lunch and at least three hours for dinner). We recommend booking either lunch or dinner at Da Gelsomina, a family run fattoria where you can not only enjoy an amazing meal cooked by mama, but also explore the farm and visit with pigs, chickens, and rabbits. Call the restaurant or have your concierge schedule a pickup. Afterward, walk home along the (mostly flat) road back to town to work off your meal. Be sure to stop at the overlook while you’re there. The restaurant at Hotel Caesar Augustus is phenomenal and has incredible views of the Gulf of Naples. It’s worth making a reservation there even if you choose to stay at another hotel. If you’re planning to take a boat trip, start or end the trip at Ristorante La Fontelina. It’s the perfect beachside lunch spot. Enjoy pasta, fish, and a bottle of wine while overlooking the Mediterranean sea and the Faraglioni. It’s also a beach club, so you can stay and bathe in the sun on the rocks to or take a dip in the amazingly blue water. Get our easy fresh tomato pasta recipe inspired by our lunch. Looking to eat under lemon trees? 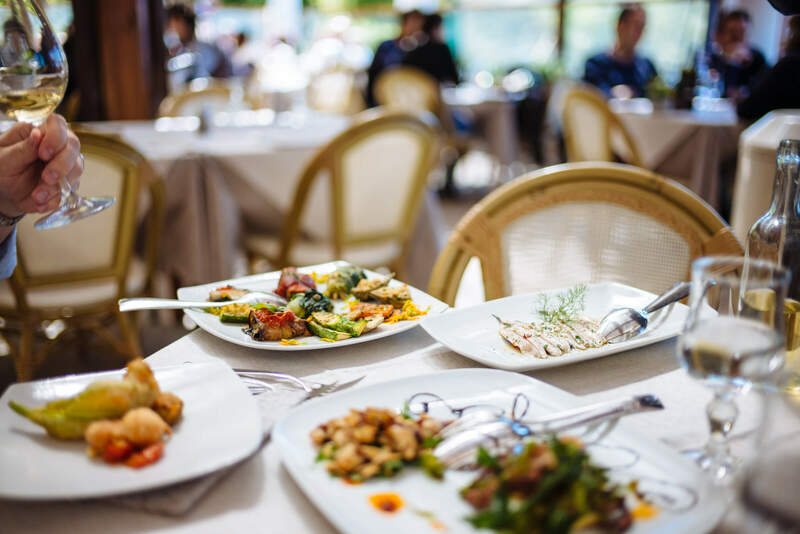 Have lunch or dinner at La Zagara Restaurant in Anacapri. Stop in for an apertivo at Hotel Caesar Augustus’s bar. Try one of many inventive cocktails with ingredients from the garden. We’re told the Capri Palace has a great rooftop bar. We did not have time to check it out, but if you do, let us know how it was. Don’t forget to try the Caprese salad and Caprese ravioli while you’re on the island. The tomatoes are amazing and will make it even better tasting than you can imagine! What to do in Capri. If you like history and nature, take a hike to one of the Roman ruins located around the island. (Not so) fun fact: Emperor Tiberius is said to have lured enemies to Capri for “parties” only to throw them off a cliff. After observing the abundance of very tall, very sheer cliffs around the island, this seems entirely plausible. If you don’t like heights, walk along the streets of downtown Anacapri or Capri. There are tons of shops and historic churches to explore along the way. If you do like heights, in Anacapri you’ll find a chairlift that takes you to the top of Mount Solaro, the highest point on the island. From there you can enjoy the panoramic views and a cocktail at the bar. Schedule a boat tour around the island. You’ll visit some of the most well-known gems of the island including the Blue Grotto, White Grotto, Green Grotto, and the Faraglioni. Two hours is sufficient to see the entire perimeter of the island, but you can book longer excursions and take a dip in the ocean or just relax under the Mediterranean sun. If you’d like to visit the famous Blue Grotto, bring cash. There are three lines for the grotto. If you’re on a private tour you get priority (even more reason to book a boat tour! ), but you’ll still need to pay to get into one of the small boats that take you into the grotto. It’s only open when the sea conditions are safe, so you can check with your concierge the morning of the tour to see if it’s open. If you’re ready to brave the crowds, go into town to do some serious shopping. You’ll find everything from local custom sandals to luxury boutiques including Hermès, Prada, and Isaia (by far our favorite Neapolitan tailor – their colors are amazing and craftsmanship top-notch). We love that when you go to boutique stores in Italy, you’re typically offered a cocktail or espresso. The Isaia store has an amazing bar in the back of the shop, including rare gin and whiskey selections. We, of course, had to try an Aperol spritz and a gin and tonic. We can’t wait to go back! Take a cooking class. Currently, Hotel Caesar Augustus and JK Palace offer cooking courses. Caesar Augustus also offers distilling experiences at their bar, and Da Gelsomina plans to offer cooking classes starting in the summer of 2018. Grab an open-air taxi at least once during your time here. It’s a fun experience and perfect for some quick photo ops as you drive down the coast. Most beaches are rocky here, so don’t expect any white sand. For that, you may want to check out the neighboring volcanic island of Ischia. 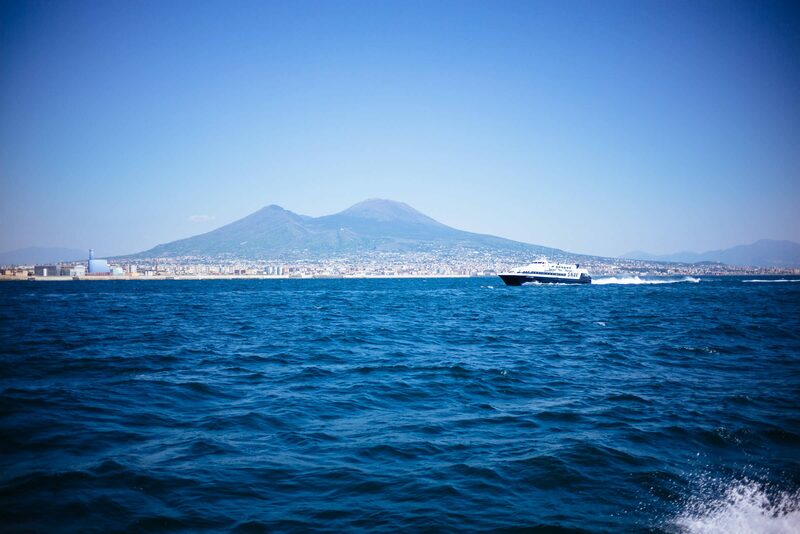 You can usually take a direct hydrofoil boat from the port of Napoli or from Positano. The schedule changes based on the season, so make sure you check the dates and times for boat rides. In high season ferries from Napoli leave about once an hour. There’s no need to buy tickets in advance. Most boats leave from Molo Beverello in Napoli and the taxi fare from the Napoli Centrale train station is around 11 euros. Confirm this with the taxi driver in advance (most will not want to take a credit card). High season typically begins in April and ends in October. If you come during the beginning or end of the season, it tends to be less crowded, but not everything will be open. Check before you book your travel to make sure you won’t miss out on what you want to do. Read our article on the best time to visit the Amalfi Coast. Watch our video below for highlights from our recent trip to Capri. wow this will definitely be on my wishlist/bucketlist for my next holiday destination!